In second pAsuram, AzhwAr says to those who are created by emperumAn “You and the dhEvathAs you worship are the same [when it comes to being created by bhagavAn]; hence, you take shelter of thirunagari where sarvESvaran who is eternal wealth, is standing mercifully”. pal ulagIr – Oh those who are residing in different worlds (due to your quality and taste)! parandhu senmingaL – engage everywhere. sarvESvaran, the first benefactor who created the dhEvathAs you determine [to be worshippable] and surrender unto, and you as well, during the creation, who is having eternal auspicious qualities such as gyAnam (knowledge), Sakthi (ability) etc and greatness, is residing well fixed in this divine abode thirunagari which is beautiful due to being surrounded by mansions and palaces; oh those who are residing in different worlds! you engage in singing, dancing and praising him everywhere. nAdi nIr vaNangum dheyvamum – While the dhEvathAs themselves withdraw them from being glorified due to not having true glories but glories which are built only through fake statements and fake speeches, you try hard and make them stand upright by false praises which are not present in them – such dhEvathAs. nAdi – Like a thief is searched and caught, these dhEvathAs are to be searched and found. They are the one who stole goat; since they brought a goat for sacrifice as said in thiruvAimozhi 4.6.7 “aNangukku aru marundhu angu Or Adum kaLLum” (What is the benefit of your praying to the other dhEvathA to cut a goat). As said in “kaLLar achcham kAdu koLLAdhu” (the fear of the thieves is beyond the capacity of the forest), the dhEvathAs will fear for those who come to surrender unto them to be those who have come to catch them. nIr – You who are having rAjasa and thAmasa quality. AzhwAr is saying “You” to highlight that he cannot co-exist with them. They (those dhEvathAs) have nothing to sustain themselves other than your faith in them. nIr vaNangum dheyvamum ummaiyum – While creating the dhEvathAs you worship who are having rAjasa and thAmasa quality, along with yourself. mun padaiththAn – During creation, he first created them and then created you. As said in svEthAsvathara upanishath “yO brahmANam vidhadhAthi pUrvam“ (first bhagavAn created brahmA), bhagavAn created brahmA first followed by everyone else here. 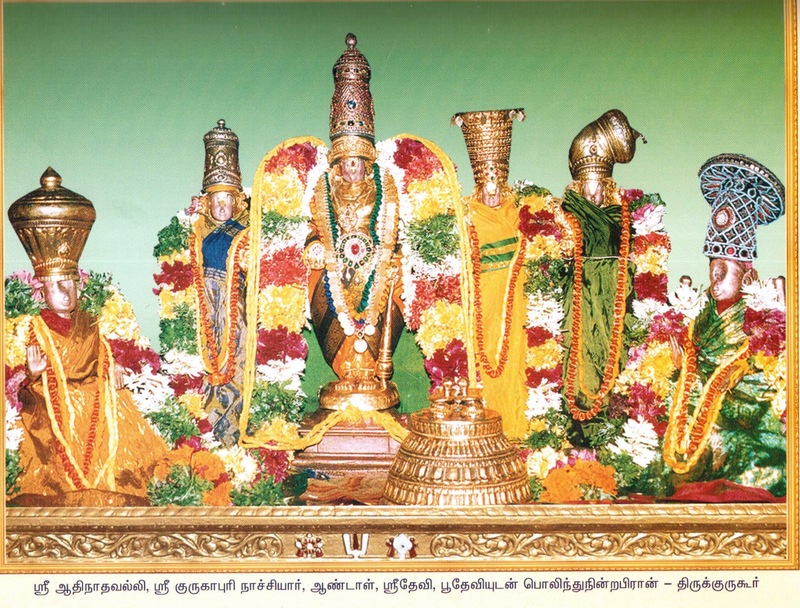 nIr vaNangum dheyvamum ummaiyum mun padaiththAn – Unless he created those dhEvathAs how would you all worship them? padaiththAn – If he does not create those dhEvathAs who will you worship? Only when you worship, they become worshippable deities. vIdil sIr … – emperumAn is having natural opulence unlike those dhEvathAs whose wealth are under the disposal/control of an individual (bhagavAn), based on their own past karma and when that karma is exhausted, their wealth will also be exhausted. vIdil sIr – bhagavAn’s wealth is unlike the wealth of the dhEvathAs you worship which have a boundary/limit; their wealth is based on their karma and when the puNya (virtues) diminishes, their wealth too will decrease; or when the mercy of emperumAn who benedicts the opulence reduces, their wealth will decrease too. uththara mImAmsA 3.2.37 “pala matha:” (all benefits are received from that supreme lord). vIdil sIr – emperumAn who is having eternally auspicious qualities. As said in “thasmin yath anthas thadhupAsithavyam” (that which is inside him is also to be meditated upon), just as we meditate upon emperumAn, we shall also meditate upon his auspicious qualities. pugazh – Being famous for protecting everyone. Would he who protects everyone be not considered as the protector? SrI rAmAyaNam kishkinthA kANdam 15.19 “yaSasaSchaikabhAjanam” (one who is the abode of glories). Adhip pirAn – Not only he is famous for protecting others, he also has natural relationship with everyone. pirAn – Not just naturally related to everyone, but also the benefactor for everyone. One who is benefactor; naturally related and famous; one can surrender unto some one who has all the opulence and eternally auspicious qualities only; it is not apt to surrender unto some one who does not have these. That which is the cause for everything is to be meditated upon – chAndhOgya upanishath “kAraNam thu dhyEya:”. avan mEvi uRai kOyil – bhagavAn remains with anguish in paramapadham. Considering the sufferings of samsAris, he remains in paramapadham thinking “what are they going through?”. Only for the liberated souls who were previously suffering in this material realm, there is no necessity to think about the sorrows of this material realm, as said in chAndhOgya upanishath 8.12.3 “nOpajanam smaran idham SarIram” (AthmA will not contemplate about the material body after reaching the spiritual realm). bhagavAn does not have the shortcoming of “when enjoying, by thinking about sorrows, one’s joy may be reduced”. While bhattar mercifully explained “emperumAn mercifully resides in paramapadham thinking about the suffering of the samsAris, in his divine heart with anguish”, a person named “paNdithar” presented a question to him saying “AchchAn and piLLai AzhwAn heard this and asked if it is appropriate to consider emperumAn who is with great joy in paramapadham to be in anguish?”. bhattar mercifully explained “Did you not ask them if the SrI rAmAyaNa SlOkam in ayOdhyA kANdam 2.42 ‘vyasanEShu cha manushyAnAm‘ (SrI rAma becomes anguished seeing others suffer) explained in context of emperumAn‘s glorification or in his shortcoming? If something is explained as an auspicious quality [here], would it not be present there too?”. He is explained as said in SrIvishNu purANam 6.5.84 “samastha kalyANa guNAthmakOsau” (one who is having all auspicious qualities naturally). Other than saying that he does not experience anything based on karma without his own desire and If there is no personal experience for him based on his own mercy [towards others], it will indicate that bhagavAn is not even a chEthana (sentient being) [since any chEthana will have personal experience/emotions]. It is said in mahOpanishath, “sa EkAki na ramEtha” (SrIman nArAyaNa, who was alone during deluge, was not joyful) while he has nithya vibhUthi (spiritual realm) and auspicious qualities. 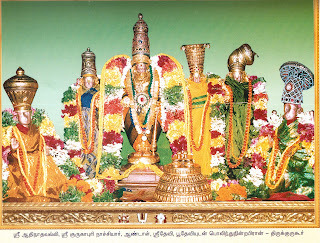 Adhip pirAn avan mEvi uRai kOyil – As there is none who is lesser than him in paramapadham (to protect), emperumAn happily comes and resides in this abode (AzhwArthirunagari) where samsAris seek protection, like a mother would give up the comforts of her own bed etc and lie down next to the cradle of her child. mAda mALigai … – Anyway, you like beautiful towns; doesn’t this place appear to be similar to that which is desired by liberated souls? Being surrounded with mansions and palaces and hence looking very beautiful. adhanaip pAdi Adi – AzhwAr is saying – “adhanuL ninRa Adhip pirAn” (the Adhip pirAn who resides in this town) is also extraneous. The abode itself is the attainable goal as said in garuda purANam 11th chapter “vishNOrAyathanEvasEth” (one should live in the divine abode of vishNu) and “dhESOyamsarvakAmadhuk” (the abode which can fulfill all desires). pAdi Adi … – Singing out of overwhelming love, dancing by swaying the body and calling out emperumAn‘s names in a disorderly manner. AzhwAr thinks that like himself others would also behave the same way as soon as they hear the name of emperumAn’s abode. pal ulagIr – It is not that some one is approaching AzhwAr with very humble and obedient attitude and AzhwAr is instructing him; looking at the suffering everywhere in the world as said in “ivai enna ulagiyaRkai” (How sad is the situation here), AzhwAr is instructing everyone. parandhE – Like how everyone would arrive from all directions to SrIrangam for periya thirunAL (adhyayana uthsavam), AzhwAr is saying “go over in all directions and sing the glories everywhere”. This entry was posted in thiruvAimozhi, thiruvAimozhi 4th centum on April 25, 2017 by Sarathy Thothathri.